Microsoft is set to report earnings on July 22, and CEO Satya Nadella plans to elaborate on his new strategy for the company. As the role of computing in peoples' lives changes, Nadella's words will be far more important for investors than Microsoft's quarterly results. 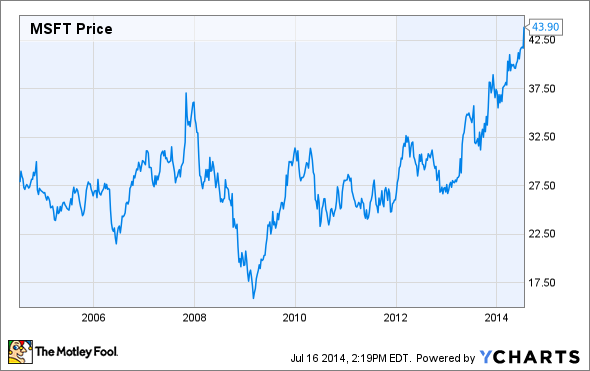 Since the beginning of 2013, shares of Microsoft (NASDAQ:MSFT) have soared after being stagnant for nearly a decade. The company's earnings finally caught up with its valuation, and new CEO Satya Nadella, combined with three consecutive earnings beats, have led to happy Microsoft investors. But new threats are looming, such as an enterprise partnership between Apple (NASDAQ:AAPL) and International Business Machines (NYSE:IBM), and that could put a damper on Microsoft's share price. Microsoft is set to report its fourth quarter earnings on July 22, and while analysts are expecting solid revenue growth, details of Microsoft's new strategy is the most important piece of information that investors will receive. Nadella outlined his strategy in broad strokes in a blog post on July 10, but the company's conference call should shed some light on Microsoft's strategy going forward into fiscal 2015. Nadella has painted Microsoft as "a productivity and platform company for the mobile-first and cloud-first world," a shift from former CEO Steve Ballmer's "devices and services" strategy. Recent moves by Microsoft, such as creating Office apps for the iPad, are right in line with the new direction Microsoft is taking. Microsoft has always been a company focused on productivity. Microsoft Office is the company's most important product in terms of profitability, and Microsoft estimates that over 1.1 billion people around the world use its productivity software. As long as the PC remained people's sole computing device, Microsoft's strategy of tying its software to Windows made sense. But as mobile devices have now relegated Windows to a small fraction of total computing devices, Microsoft's dominance in the productivity software market has come under threat. For Microsoft investors, the most important thing going forward is Microsoft's ability to maintain the profits it derives from Office. There are plenty of opportunities for Microsoft to grow in other areas, like its Azure cloud computing platform, but if Office starts to crumble, so does Microsoft. Office 365, Microsoft's subscription version of Office, is an attempt to transition Office from a one-off software purchase to a subscription service, and it's part of Microsoft's effort to bring Office to every computing device, regardless of platform. The aforementioned Office iPad app requires Office 365 in order to edit files, and Microsoft plans to soon release a version for Android tablets as well. As PCs no longer have a monopoly on productivity, Microsoft is trying to adapt. One possible threat for Microsoft could be the recent partnership between Apple and IBM. Under the agreement, IBM will create easy-to-use business apps for Apple's iPhones and iPads, and the company will also sell the devices directly to its corporate customers. Apple is tapping IBM's status in the enterprise, along with its consultants ready to provide on-site support for Apple products, in an effort bolster its position in the enterprise market. Apple already sells plenty of hardware to enterprise customers; in 2013 businesses and governments bought $11 billion worth of iPads, or roughly one-third of total iPad sales for the year. But this partnership marks a far more serious effort by Apple to cast its devices as productivity tools rather than just consumption devices, and that may pose a real threat to Microsoft. Microsoft is laying off 18,000 workers, including 12,500 from its Nokia operations. Microsoft has struggled to grow its earnings recently, and if analysts prove to be correct, Microsoft's EPS will have remained stagnant for three years when the company reports next week. These layoffs should help trim the fat, although integrating Nokia could lead to short-term declines in earnings. Beyond cutting costs, these layoffs should also make the company leaner and more responsive, something that Microsoft has struggled with as the smart phone revolution passed it by. The numbers reported next week by Microsoft will be less important than Nadella's strategy update. Microsoft is facing the kinds of threats that it hasn't faced in a long time, but at the same time opportunities for growth are abound. The challenge for Nadella is maintaining the advantages, and thus the profitability, that Microsoft has built over the years, while adapting to the changing role of computing in people's lives. The PC is no longer the center of the universe, and Microsoft's strategy needs to reflect that.